6 layers of homemade chocolate cake, fluffy white frosting and thick chocolate ganache make up this grown up ho ho cake. Dessert never tasted so good! My dad had a work party at our house last week, and I was excited to be in charge of making a few desserts for it. Well, a couple of desserts turned into about 3 dozen cookies and 2 colossal cakes. I was baking all morning getting things in the oven, icing cakes, and rolling cookies into balls and then in sugar. Whew! Talk about a long morning! One of my favorite parts, though, was to make this beautiful Layered Ho Ho Cake. It’s pretty simple for a 3 layer cake. The hardest part, I thought, was trying to pour 1 recipe of cake batter into 3 pans. Which isn’t that hard, but the perfectionist in me wanted the cake layers perfectly even. I didn’t succeed in getting them perfectly even, so one layer is thicker than the other two. But in the end,when this beauty is iced and your mouth is drooling from all of that chocolate, no one notices. I don’t know any kid that doesn’t like Ho Ho’s. And maybe even any adult, for that matter. Right now I’m being homeschooled, but as soon as I saw these chocolate rolls, it took me back to my school lunchroom days. They were one of my favorite desserts for my mom to pack for me. I love homemade cookies and all, but you have to admit, a Swiss Cake Roll once and a while isn’t that bad. For the chocolate cake in this recipe, I used the same recipe that I used for my Reese’s Peanut Butter Cake. This time, though, I used a cooked frosting recipe that will taste just like the ho ho filling that you love. And what goes on top? A thick layer of chocolate ganache, which is simply melted chocolate chips and heavy whipping cream. Store this cake in the fridge if you are not eating it right away. I removed the ho ho cake from the fridge about an hour before we were going to eat it. We all actually liked the cake better on the second day. The layers seemed to settle together. On the second day, though, I didn’t put it back in the fridge and, because the cake was cut, it all ended up sliding apart. The ho ho cake was a mess, but let me tell you…it was one goooood mess. If you’ve got leftovers, store them in the fridge in order to keep it neat and tidy. 6 layers of homemade chocolate cake, fluffy white frosting and thick chocolate ganache make up this grown up ho ho cake. It's a grown-up version of your favorite lunchroom snack. Preheat oven to 350 degrees. Grease and flour 3 round 9-inch cake pans. Divide the batter evenly into the three prepared pans and bake for about 20-25 minutes or until a toothpick inserted in the middle comes out clean. Turn the cakes out onto a cooling rack. While the cakes are cooling, make your filling. For the creme filling,combine the milk and flour in a saucepan and cook over medium-low heat, stirring constantly, until the mixture thickens. It should get to be the consistency of runny pudding, which will take about 10-15 minutes. Remove the mixture from the heat. It will continue to thicken as it cools. Press plastic wrap down on top of the flour mixture while it is cooling so it does not form a "crust" on top. Cool to room temperature. While this is cooling, cream together the rest of the filling ingredients: the sugar, butter and shortening, on medium speed until fluffy, about 3 minutes. Add the cooled flour & milk mixture and beat on high for 7 minutes. Spread this filling between the cooled three layers of cake. Now it is time to add your chocolate ganache! Put your chocolate chips in a bowl. Set aside. Heat heavy cream in a saucepan on medium/high until it comes to a boil. Watch it closely and stir often so it does not scald. Once it is very hot and near boiling, remove it from the heat and immediately pour it over the chocolate chips. Cover the bowl with a lid or plate and let the it sit for 3 minutes. Then, stir until the chocolate is completely melted and the mixture is smooth. Allow it to sit for about 20 minutes until the ganache thickens a bit. Once your ganache is ready, pour it over the top of your layer cake. Use a spoon to spread it out towards the sides of your cake so it runs down a bit on the sides. 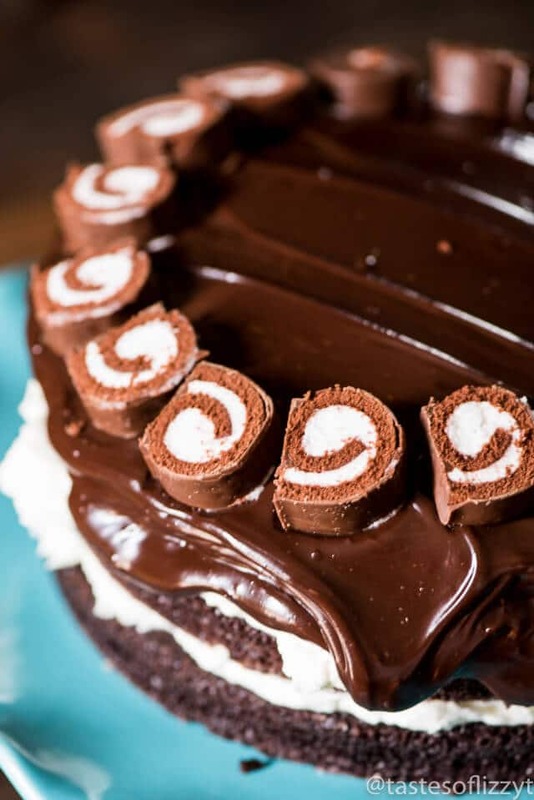 Decorate the top with Swiss Cake Rolls, if desired! Oh my goodness, that looks DELICIOUS! I just printed the recipe. And once again, your photography is fabulous! You GO girl! I just made your cake today! EVERYBODY loved it and thought it looked like it came from a bakery. I had to make one adaptation—only because my family doesn’t drink coffee—but it was still delicious. Thank you so much for sharing!!! What did you substitute with? Oh my this cake looks divine! And the glossy dripping ganache is making my mouth water! Thanks!! It was sooooo good! Your cake really looks perfect! WOW!!! This is amazing! I am completely craving HoHos now. My boys are wanting to learn to cook this summer—I think we are going to have to try this one! Thanks for sharing. Our Simply Create Link party is going on right now. I would love to have you link up, as I’m sure my followers would love to see this incredible cake too. Hope to see you soon! Just linked up! Thanks so much and I hope you & your boys enjoy your cake when you make it!! Thank you for linking up this wonderful cake at our Simply Create Link Party! I just wanted to pop by and let you know that you are being featured and pinned tonight! Hope to see you again on Thurs. night! Thanks so much for featuring my cake!! You literally took my favorite childhood treat and turned it into even more deliciousness! I can’t wait to try this! This cake! It is incredible. I loved Ho Ho’s growing up, so looking at this cake makes me feel like a kid again. I made this for my son’s 9th birthday and it was a HUGE HIT. One comment was, “Dad, our dream has come true!” from a family that buys Ho Ho’s and to see a giant one was out of this world. It is kind of sweet but so good. That same family took a doggie bag home of the leftover pieces people left on their plates, that is how well they liked it. I made it in a 9×13 pan and then cut it crosswise for the cream filling. We love our ho ho’s, too, Susan! I’m glad you all enjoyed it. Yes, it’s sweet! I like that you made it in a 9×13 pan, too. Thanks! This is so brilliant! My niece would love this!! I don’t think I’ve ever had a ho-ho, but I need this cake. I’ll have to actually try them one day. Hello, I cannot view the recipe for some reason. Is there anyway I could have it sent to my email? Thank you! Thanks for this recipe, my children (including husband) enjoyed it. I can not have dairy or gluten so I was wondering if there is a way to make it that way? Hi! what is your thought about substituting the heavy cream in the ganache with light cream? I happen to have a quart of light cream on hand, thought I’d give this a try. Goodness that is a gorgeous cake! Half & Half in place of the milk?